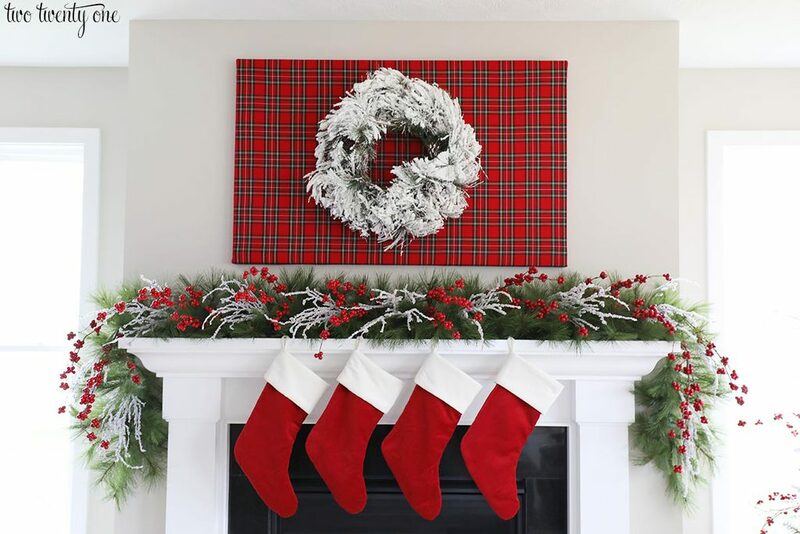 Last year, I had the bright idea to cover a canvas with Christmasy red and white buffalo check fabric, thus creating custom Christmas art to hang above our mantel. I did the same thing for my Halloween mantel this year. Well, guess what, I did it again. But this Christmas, I went with a red tartan. The red velvet stockings (medium size) are brand new this year. So new that I didn’t even have time to get them embroidered with our names yet. It’s fiiine. I’ll do it next year. 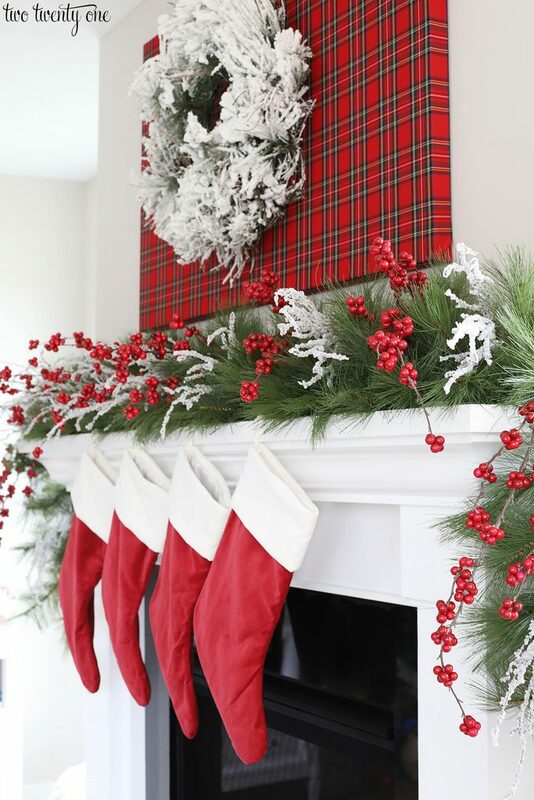 I plan on filling these cute stockings for the boys anyway. In case you’re wondering, I secured the stockings to the mantel with these handy little things. I also beefed up the long needle pine garland with more substantial picks. The picks were pretty big off-the-shelf, so I deconstructed them into smaller pieces using wire cutters. So keep that in mind when shopping for picks– you can always turn a giant pick into several smaller sections. The Christmasy canvas is really easy to make, but I can post the tutorial if you want to know. I feel like I didn’t get much feedback last year, so I never posted it. But the key to getting the canvas for an amazing price is to buy it on Black Friday. I scored my 30″ x 48″ canvas for 75% off. But I looked, and the size I purchased is on sale for $28, which is still a great price. The tartan doesn’t totally mesh with the tree, but I couldn’t find red tartan gift wrap that I liked until last week, and then it was too late. So here we are. And in case you missed it, here’s all the info on our Christmas tree. Beautiful – it all looks so good! Absolutely beautiful! 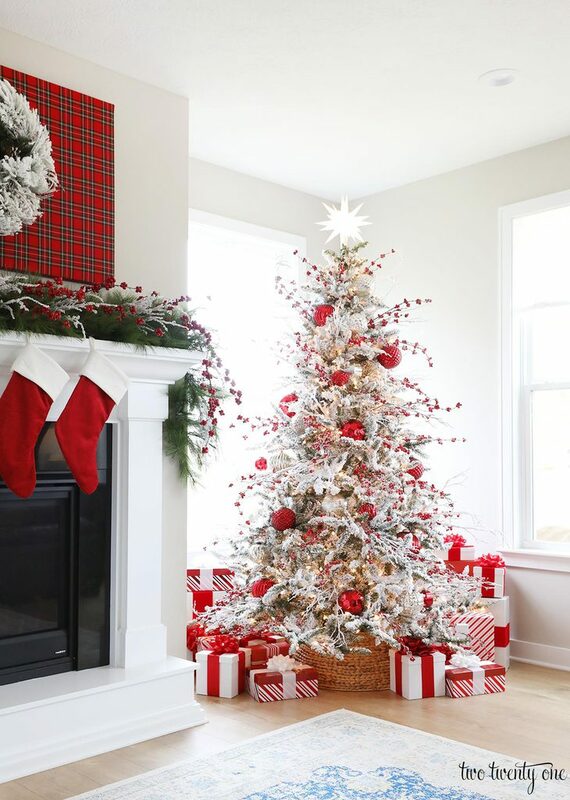 I never thought a white tree would look nice, wow, was I wrong, so gorgeous! I wish I had your talent. Beautiful! 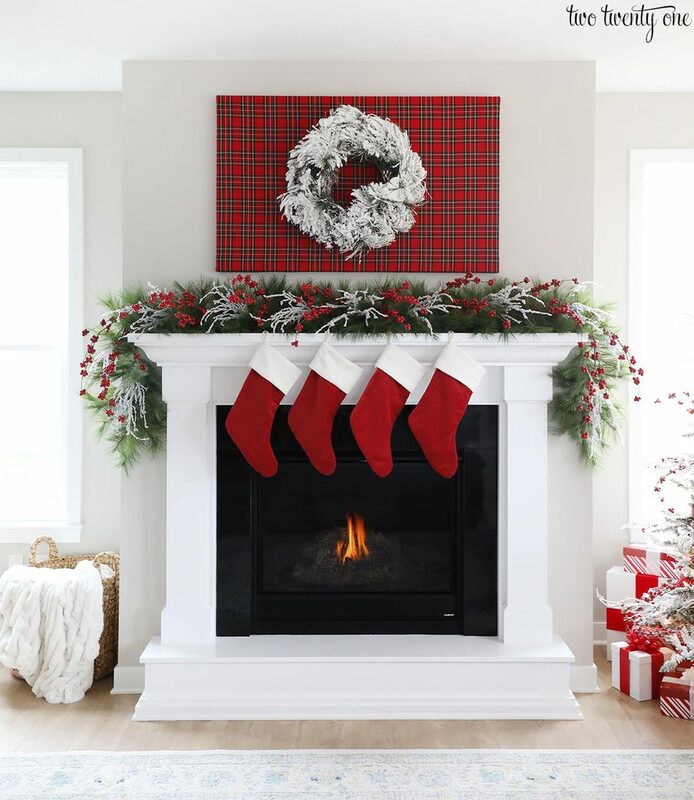 Your wrapped canvas last year inspired me to “wrap” the painting we have on our mantle in some festive burlap fabric. By wrap, I mean drape because I just wanted to see how it looked… but I have a 2 year old, so I have a funny feeling it will stay as it is, lol! 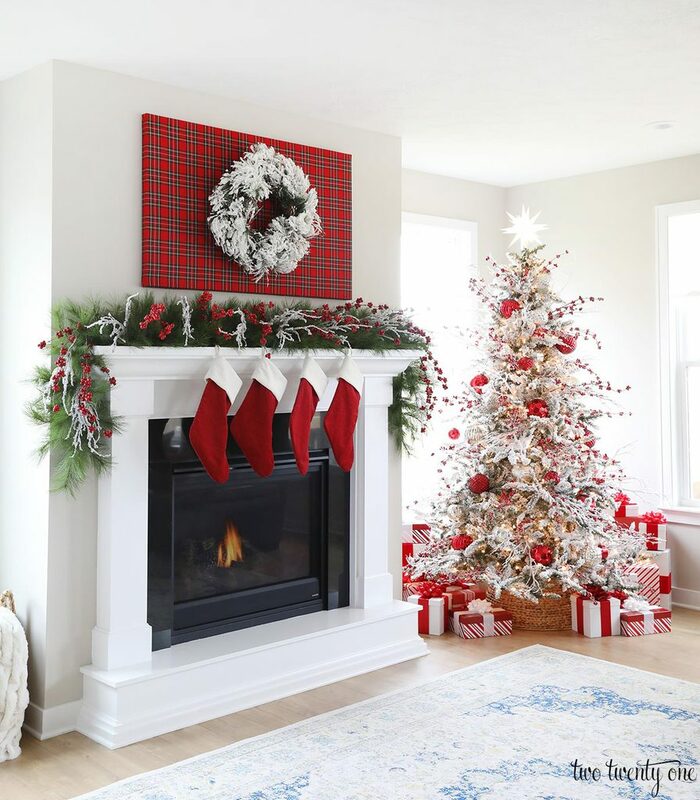 I love it layered with the wreath! I never would have thought to wrap a canvas like that. It is beautiful, and a great way to add color. I guess you could also use wrapping paper if you wanted to match. Everything looks beautiful. I am obsessed with your flocked tree. I’m thinking I will be needing one of those next year, lol. Thanks for sharing. So Christmasy and festive!! 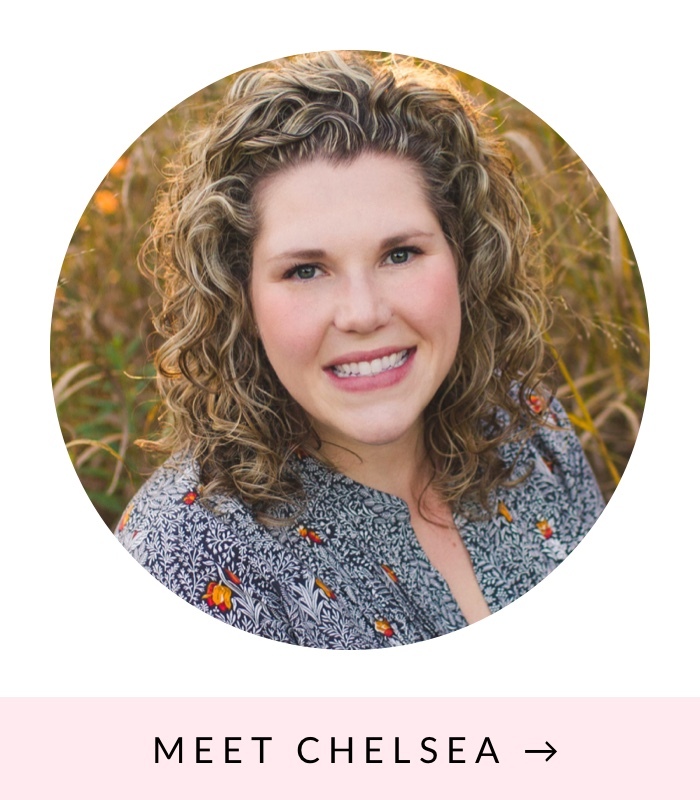 Great job, Chelsea! !